This article is about the Soviet/Russian submarine class with NATO reporting name "Typhoon", but with native name "Akula". For the submarine class with NATO reporting name "Akula", see Akula-class submarine. Typhoon-class submarines feature multiple pressure hulls, similar to the World War II Japanese I-400-class submarine, that simplifies internal design while making the vessel much wider than a normal submarine. 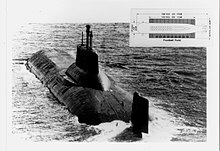 In the main body of the sub, two long pressure hulls lie parallel with a third, smaller pressure hull above them (which protrudes just below the sail), and two other pressure hulls for torpedoes and steering gear. This also greatly increases their survivability — even if one pressure hull is breached, the crew members in the other are safe and there is less potential for flooding. A Typhoon-class submarine on the surface in 1985. 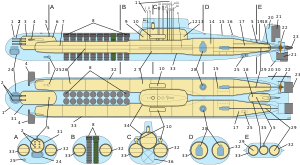 Soviet Typhoon-class ballistic missile submarine, with inset of an American football field graphic to convey a sense of the enormous size of the vessel. Six Typhoon-class submarines were built. Originally, the submarines were designated by hull numbers only. Names were later assigned to the four vessels retained by the Russian Navy, which were sponsored by either a city or company. The construction order for an additional vessel (hull number TK-210) was cancelled and never completed. Only the first of these submarines to be constructed, Dmitriy Donskoy, is still in active service with the Russian Navy, serving as a test platform for the Bulava (SS-NX-32) missile. Arkhangelsk (TK-17) and Severstal (TK-20) remain in reserve, not currently active with the Russian fleet. All the R-39 missiles have been retired. The Typhoons have been replaced by the Borei class since 2010-2011. TK-202 22 April 1978 23 September 1982 28 December 1983 Withdrawn from active service in June 1999, scrapped with the financial support of the U.S.
10 February 1982: Entered 18th division (Zapadnaya Litsa), NOR. December 1982: Transferred from Severodvinsk to Zapadnaya Litsa. 1983-1984: Tests of D-19 missile complex. Commanders: A.V.Olkhovikov (1980–1984). 3 December 1986: Entered Navy Board of the Winners of the Socialist Competition. 18 January 1987: Entered MoD Board of Glory. 20 September 1989 – 1991: Repairs and refit at Sevmash to Project 941U. 1991 refit cancelled. 1996: Returned to 941U refit. 26 June 2002: End of refit. 30 June 2002: Start of testing. 26 July 2002: Entered sea trials, re-entered fleet, without missile system. December 2003: Sea trials; refitted to carry a new Bulava missile system. New missile system expected to be operational by 2005. 9 October 2005: Successfully launched SS-NX-30 Bulava SLBM from surface. 21 December 2005: Successfully launched SS-NX-30 Bulava SLBM from submerged position on move. 7 September 2006: Test launch of the Bulava missile failed after several minutes in flight due to some problems in the flight control system. The missile fell into the sea about a minute after the launch. The sub was not affected and was returning to Severodvinsk base submerged. Later reports blamed the engine of the first stage for the failure. 25 October 2006: Test launch of the Bulava-M missile in the White Sea failed some 200 seconds after liftoff due to the apparent failure of the flight control system. 28 August 2008: Underwent successful testing at the Sevmash shipyard in Severodvinsk, Arkhangelsk Oblast. More than 170 men worked with the Dmitriy Donskoy, 100 of them employed at the Sevmash plant and 70 at other companies. 19 February 1988: Entered 18th division (Zapadnaya Litsa) NOR. 8 January–9 November 2002: Refit at Sevmash. In July 2002, crew petitioned Main Navy Headquarters to adopt the name Arkhangel'sk (renamed on 18 November 2002). 17 February 2004: Took part in military exercises with President Vladimir Putin aboard. 28 February 1990: Entered 18th division (Zapadnaya Litsa), NOR. November 1996: Successfully launched SLBM from North Pole. 24 July 1999: Took part in parade on Navy Day in Severomorsk, NOR. November–December 1999 – distant cruise. June 2001–December 2002: Repairs at Sevmash. Satellite image of the Typhoon-class submarine at Severodvinsk. Declassified in 2012. In 2009 a blogger posted dozens of photos of the interior of a Typhoon submarine at Nerpichya Naval Base,  perhaps TK-12 or TK-13 based on the state of decay, claiming the photos were taken in 2004. That pair of aging submarines were decommissioned several years prior, in 1996 and 1997. Typhoon-class submarine, covered with ice. 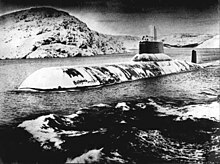 Probably the best-known fictional Typhoon-class submarine was the stealth equipped Red October, the subject of the Tom Clancy novel The Hunt for Red October and its 1990 movie adaptation, starring Sean Connery as the fictional Captain Marko Ramius. In 2008 National Geographic released a documentary about the scrapping of one of the Typhoons in the series Break It Down. This boat is TK-13, which was scrapped over the time period 2007–2009. ^ Only 20 torpedoes and/or AShMs can be loaded. ^ "Submarine Milestones - Largest Subs". National Geographic. 1981-12-12. Retrieved 2011-08-14. ^ Waller D.C. (March 2001). "Essay - The Hunt for Big Red" (PDF). Wake Forest Magazine. 48 (3): 28–31. Retrieved 13 October 2009. ^ Hitchens, Theresa (2001). "Get a policy, please". Bulletin of the Atomic Scientists. 57 (2001): 21–23. doi: 10.2968/057001008. ^ "Russian Navy Abandons Akula Modernization Project". Russian Navy. 2012-07-03. Retrieved 2012-09-26. ^ a b c "Russia, USA Liquidated Entire Class of Ballistic Missiles". Russian Navy. 2012-09-17. Retrieved 2012-09-26. ^ "941 TYPHOON - Russian and Soviet Nuclear Forces". Federation of American Scientists. Retrieved 2011-08-14. ^ "The Massive Soviet Sub That Inspired 'Hunt For Red October'". Foxtrot Alpha. ^ "World Naval Developments: The Typhoon Saga Ends | U.S. Naval Institute". www.usni.org. Retrieved 2017-08-11. ^ "Typhoon Subs to Ship Oil and Gas - Bellona.org". 14 May 2003. ^ "Russia to hold more test launches of Bulava ICBM in 2009". RIA Novosti. 16 December 2008. Retrieved 2011-08-14. ^ Олег Ласточкин (26 June 2009). "Стратегические АПЛ "Тайфун" останутся в боевом составе ВМФ РФ | Оборона и безопасность". RIA Novosti. Retrieved 2011-08-14. ^ "Russia set to keep Typhoon class nuclear subs until 2019". RIA Novosti. 7 May 2010. Retrieved 2011-08-14. 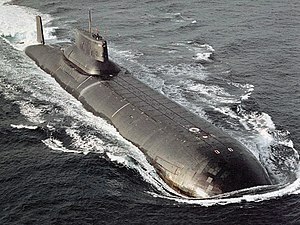 ^ "Russia To Dismantle World's Biggest Subs". Russian Navy. Retrieved 2011-09-29. ^ "Russia's gigantic Typhoon submarines to be scrapped". Pravda. 29 September 2011. ^ "No plans to retire Typhoon class subs soon – Russian military". RIA Novosti. 2011-09-30. Retrieved 2012-07-22. ^ "Russia to Scrap World's Biggest Nuclear Subs". RIA Novosti. 2013-05-21. Retrieved 2013-08-17. ^ a b c d e "Решение об утилизации самых больших в мире АПЛ "Акула" пока не принято". ria.ru. 2016-11-11. ^ a b "Look who's coming; world's largest submarine en route south". ^ ""Дмитрий Донской" прибыл в Североморск". 27 May 2017. ^ "25.02.10 "Булаву" впервые испытают на АПЛ проекта "Борей" - Военный паритет". Militaryparitet.com. Retrieved 2012-07-22. ^ Text: Trude Pettersen (2009-06-04). "One sub out, another one in". BarentsObserver. Archived from the original on 2012-02-15. Retrieved 2011-08-14. ^ "Captain who saved White Sea from nuclear disaster dies at 67". ^ @JosephHDempsey (30 April 2015). "Damage to #Russia Navy TK-17 Typhoon SSBN after missile explosion during 1991 training launch h/t @russianforces #TBT" (Tweet) – via Twitter. ^ "Nerpichya Naval Base - Wikimapia". wikimapia.org. ^ "ru_submarine: тип 941 акула она же typhoon: самая большая лодка в мире". Ru-submarine.livejournal.com. Retrieved 2013-08-17. ^ "Mission Invisible 52' - Television - Distribution - ZED". www.zed.fr. Retrieved 2016-07-30. ^ "Full record for 'AUF UNSICHTBARER MISSION MISSION INVISIBLE' (8144) - Moving Image Archive catalogue". National Library of Scotland. Retrieved 2016-07-30. ^ "Break It Down - Nuclear Submarine". National Geographic. Archived from the original on 2012-10-21. Retrieved 2010-08-23. 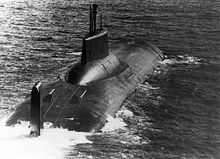 Wikimedia Commons has media related to Typhoon class submarines.